Wash, cut and boil the potatoes for 10 minutes. Put them in the oven for about 15 minutes at 300 F. Meanwhile prepare the saltimbocca with the pork loin: place and press two slices of Coppa di Parma PGI over the meat. Flour the meat on both sides, removing the excess flour. In a saucepan put the butter and EVO oil and cook the meat for about 3 minutes on each side adding a pinch of salt and pepper. Simmer with white wine until reduced. 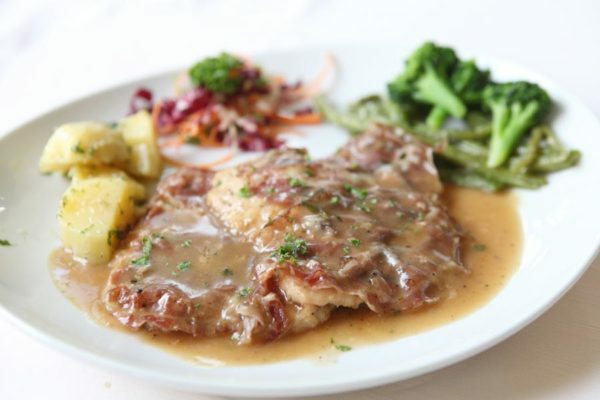 Serve the saltimbocca with the potatoes and stir-fry some vegetables like broccoli or green beans.